Stop! Don’t extract that tooth. Many teeth are needlessly taken out that are savable with endodontic treatment. Part of the problem is that we are conditioned to think that a certain look is an appropriate gauge for biologic success. A second reason is that dentists don’t feel comfortable treatment planning around complex cases, as the outcome is less predictable. This patient presented with 9/10 pain from the apical periodontitis associated with the post perforation in the distal root. After the post was removed, canal negotiated and cleaned his symptoms completely resolved. 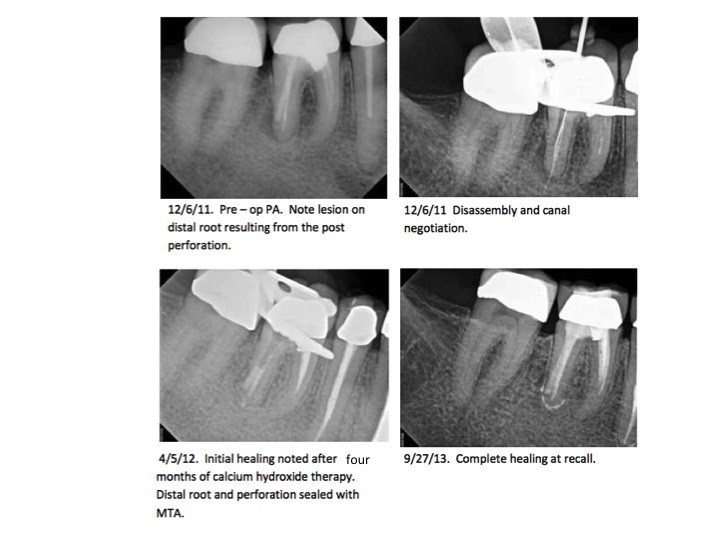 In order to gain treatment planning predictability, the case was monitored (and re-cleaned) until bone-fill was evident. The 1.5-year recall shows complete healing (note regeneration of a continuous PDL space and lamina dura). Notice that the mesial roots were not negotiable on the re-treatment, but healing still occurred since the biology was treated, as opposed to the radiographic esthetics. This patient was very happy to predictably save his tooth.